One of my few quibbles with Washburn/SLM is that their claim of a 133-year history is tripe, an outright intentional lie. The modern Washburn brand is in no way actually connected to the original Washburn brand, much the same as Danelectro. The original brand was a hot item from the 1890s to the 1920s, but took a series of socioeconomic hits: the Great Depression, WWII wood shortages, the rise of the phonograph & movies & radio for entertainment. The Washburn brand unofficially died around 1940. This took a little digging -- search engines are NOT friendly toward obscure topics -- but I found a 2005 post from a guy who says he was there at the time. In the late '50s and early 60s in Chicago, there was a violin shop owned by two German immigrants, Eric Prager and Wolfgang Ritter. At the beginning of the great folk music boom (or folk scare, take your pick) around the time the Kingston Trio became popular etc, generating a big increase in guitar sales, Prager and Ritter opened most of their floor space for guitars. It was renamed "The Chicago Guitar Gallery". Schlacher saw the potential in guitar sales, left Prager and Ritter, and opened his own retail shop, called the Sound Post, in Evanston. Eventually Rudy decided retail music would make a living, but wholesale music might provide a fortune. Thus he started importing guitars, first reproducing his own designs, than copying others. Looking for a marketing hook, Rudy knew the name "Washburn" was attached to a company whose products were now vintage, sought after, and -- unlike C.F. Martin -- were no longer available. Any rights to the name "Washburn" were long expired, and no one had attempted to copyright or reuse the name. Thus Rudy took the name "Washburn" for his line of imported guitars. Washburn was so successful, Rudy sold the retail store and concentrated entirely on his wholesale company, Washburn. And there's an article somewhere online about the original rise of Washburn, which I have yet failed to find again. I have found repeated statements that the Washburn factory had a major fire in the 1920s, which pretty much destroyed all records, so there's very little info on production numbers. Turns out that might be hogwash!! On the Ducks Deluxe website -- certainly a cool place to visit if you're a musician -- one of the honchos relays a letter he received. First of all "George Washburn" was George Washburn Lyon. He was not a guitar maker -- he was a businessman. His partner, P.J. Healy, was the guitar maker. The Lyon & Healy Company was the Chicago branch of the Oliver Ditson Company -- a very large sheet music distributing company. They did found the L&H company in 1864, but the company didn't start manufacturing guitars until 1888. L&H started as a music publisher in 1864. They later marketed several brands of instruments -- Lyon leant his middle name to the fretted variety. Healy supervised the factory, which during their peak production years, turned out as many as 100 guitars per day! They were the main supplier of stringed instruments for the various mail order catalogs, such as Montgomery Ward and Sears, until Harmony and Kay assumed that distinction with lines of considerably lower quality instruments in the late 1920s. The Washburn brand was sold to the Tonk Brothers (who also owned the Regal brand) in 1928 or '29. Regal made guitars under the Washburn label for a few years after that, then the brand was discarded. As far as I can determine, early Washburn serial numbers were pretty haphazard and never gave any indication of date of manufacture. By the way -- my research indicates that the fire happened before the turn of the century (in the1880s). The original Washburn brand disappeared in the 1930s. ...the brand name was revived in 1964. There is no connection whatsoever between the current Washburn brand guitars and the Washburns of the 19th and early 20th century. I've not heard anything good about the 1960s Washburns. Though it's possible there was some quality to be found, these seem largely to have been cheap "entry level" instruments, just commodity stuff to fill the "beginner" market, & not as good as modern Rogue much less Oscar Schmidt. But I've also heard raves about Washburn guitars from the early 1970s, so there's clearly some sort of "watershed"moment. No surprise, then, that when Washburn leapt with a vengeance into the electric guitar jungle in 1979, those classic Wing & Stage models came from Matsumoku. However, Matsumoku depended too much on their Epiphone contract, & never actually separated the guitar operation from the sewing-machine business. When Singer began to fail, & Gibson/Norlin moved to cheaper vendors, Matsumoku was forced to close its doors in 1987. As Washburn ended the Wing/Stage models in 1985, I can't help but think this contributed to the demise. And then?... How about the era of Chinese acoustics? I have a 1987 martin D-2832 whose well-made rosewood ply body was made in Japan, "assembled" in USA, typical of an era of Japanese imports, then Korea... Now the action shifts to China..
Do we know dates that Chinese factories create acoustic guitars for Washburn? & Who supplied the designs/specs to be implemented for Washburn's acoustics? Even more, the actual run dates and numbers of each model would be welcome as I've owned/played many fine insturments from years 2010-2015 and always wondered about global back-story here. Ah -- that's for someone else to write! Being mostly a "solid-body electric" fan, the acoustic stuff is a little bleary for me. Someone once said the acoustics went something like "Japan to US to Korea," but don't quote that as the source eludes me. Certainly, the first Washburn triumphs in electrics were the MIJ, then production shifted to Korea, then hived to Indonesia & Red China. As mentioned in another thread, production for some semihollows like the HB35 was literally moved from Japan to Korea by Samick. In recent years, Samick has focused on the huge Indonesia facility they opened in 1998 -- in fact, I think Washburn has some models with an "SI-" prefix. As a minor fan of the evolution of the Squier brand, it's clear that there are "teething pain" issues when moving production into a new region. Early Mexico Fenders are often terrible; nowadays, they're pretty much on par with the more expensive "USA" models (built a mere three-hour drive north, actually). Ten years ago, I sneered at Korean guitars, & today I'm usually impressed. Aside from Samick, I'm yet to be won over by Indonesian manufacture. Guitars made in India or Vietnam seem to suffer when shipped to the dryer/cooler United States, causing any number of problems wih finish, glue, splitting, warp/curl, &c.
Instruments from the PRC are (to put it mildly) a mixed bag, like Japan in the early '70s, where a factory is turning out jaw-dropping axes for cheap, & another next door creates absolute trash for the same price-point. Bumping this up for an update. Someone disputed the story with which I open this thread, as to how it sprang from Schlacher's desire to take what he learned at the Chicago Guitar Gallery, & expand into a big import/distro business. I ain't perfect, but how anyone should be allowed to run around loose without basic Google skills just amazes me. But one person asking usually means a hundred wondering, so here's something to fill the gaps. Chicago, Illinois, December 15, 2002 - Washburn International is pleased to announce the renaming of the corporation to that of U.S. Music Corporation. This is a result of the acquisition of the assets of U.S. Music Corporation inclusive of all of its intellectual properties and goodwill. As a result of that acquisition, the corporate name will be changed to U.S. Music Corp. beginning on January 1, 2003. Rudy Schlacher, CEO says "This acquisition gives us the opportunity to clearly separate the parent corporation from the name of its producing division Washburn Guitars. It also helps us to provide more equality and focus on our other producing divisions, which are helping to provide us with growth in revenues and excitement in the marketplace. Washburn Guitars, Randall Amplifiers, Vinci Strings and Accessories, SoundTech Professional Audio and Oscar Schmidt all have expansive positions and new focuses that require equality in brand recognition. U.S. Music is a great and esteemed name in the music business, and the fit is excellent as it owned Randall and Vinci prior to our acquisition." Additionally, we are pleased to announce the appointment of Garry Gryczan to the post of COO as part of the corporate change. Garry worked in the position of CFO in 1995 thru 1998. He has rejoined our management team after a hiatus, which included the Management of a home furnishings company in the position of COO. Garry has over 20 years of operations and finance management. Garry is an alumnus of the University of Chicago Graduate School of Business and holds an MBA in finance. U.S. Music Corporation will proudly be displayed as the parent Corporation at the NAMM show in Anaheim in January 2003 at booth # 5244. Many exciting events and promotions are planned to help celebrate this momentous occasion. photo: CEO Rudy Schlacher with new COO Garry Gryczan . The U.S. Music Corp. headquarters is just north of Chicago in Mundelein, Illinois. A leading musical instrument manufacturer in the industry, U.S. Music Corp. is a manufacturer and distributor of Washburn Guitars, Randall Amplifiers, Oscar Schmidt Guitars, SoundTech Pro Audio Systems and Vinci Strings. U.S. Music Corp. is dedicated to providing quality instruments to guitar players and musicians worldwide, and at the same time, continuing its legacy through the 21st century. For additional information about U.S. Music Corp., visit the company on the web at usmusiccorp.com or call 800.877.6863. USM is a leading manufacturer and distributor of fine musical instruments. It was probably a reverse merger, which at very least allowed Washburn Int'l to expand far beyond just musical instruments, but possibly also to turn his privately-held company into one offering public stock, without going through a lot of complicated SEC stuff. They ceased making guitars in 1928 and sold the Washburn brand to the Tonk Brothers Company, who also owned the Regal brand. Tonk Brothers made guitars under the Washburn brand-name for several years but had ceased to use the brand by the late-1930s and the Tonk Brothers company ceased to exist in 1947. In 1964 a Chicago music store owner named Rudy Schlacher began importing guitars. When deciding on a marketing strategy he realized that the old "Washburn" name was not being used nor was it owned by anybody else. Schlacher registered "Washburn" as his trademark and used it as the brand-name of his imported guitars. The Schlacher/Washburn imports were initially made in Japan, were later made by Samick in Korea, and then subsequently manufactured in China. The brand is still owned by Schlacher's company U.S. Music Corp. Although current marketing of the Washburn brand suggests that their instruments have been made since the 1880s there is absolutely no connection between the original guitars made by Lyon & Healy and any Washburn instruments made since 1964. Have you been to the Washburn factory in Mundelein? Yes, I've been there twice. I was curious because I was having so much difficulty finding out about Washburn guitars. The owner of Washburn [Rudy Schlacher] and I had the opportunity to talk, and he's been involved with the Washburn trade name since about 1976. I think he was one of the original people that bought the trade name from Beckmen Music in Los Angeles, so he's been involved with the company since then. Where did their imports come from? It started in Japan in 1974 with the Yairis, [Sadao and Hiroshi] who were a father and son team in that started making guitars for Washburn in '74. I think they did most of the product line through the mid-1980s until their factory burned down. And then after that Washburn was looking for the cheapest vendor with the best quality. After that it was probably Korea, starting around 2000. Washburn made so many prototypes and they're floating around God knows where. I know they've got three or four hundred hanging on the wall in Mundelein. I'm trying to get my hands on one that I saw specifically for their 2003 anniversary. It's an unusual acoustic guitar and it actually has an embossed front -- it's really hard to describe. I've never seen anything like it before, and I don't know why it didn't go into production. And it's a laminated guitar. It's almost like they took the top of the guitar and put it through a press. I think the most important thing that I've learned about Washburn guitars is that most of the product line is rare. And the reason I say that is they sell guitars differently than Gibson or Fender. They will order 200 of a particular model or of a particular series and they'll hold them at the warehouse until they are sold. And if they don't sell, they don't order them again, and that holds true for probably 60 percent of their product line since 1974. A lot of the models they ran for four or five years probably had a total production of about 200 pieces. 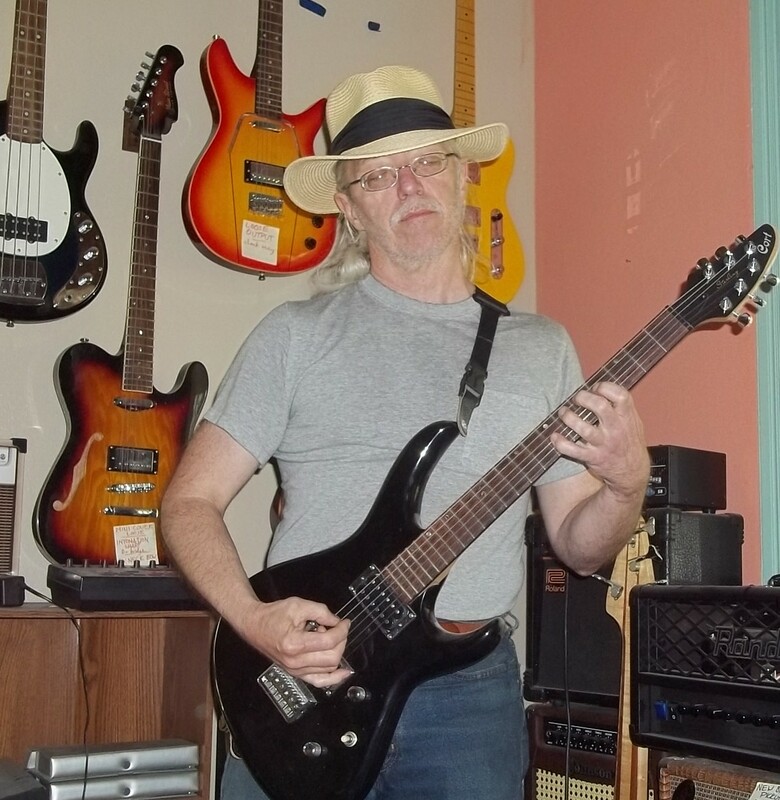 ...the information on when a model was made and the specifications is almost impossible to get through US Music Corp. People are constantly coming across Washburn guitars and can find no specifications on it, and that's sort of where I come in. It should come as no huge surprise that this thread is being used as a basis for FINALLY updating the "Washburn Guitars" Wikipedia entry. Kinda cool. (8/24/2009) -- Rudy Schlacher announced today that he is stepping down from his position as CEO of US Music Corp, an enterprise he founded four decades ago, as the company has been acquired by Jam Industries, Ltd.
Rudy stated, "We are pleased to join forces with a strategic partner like Jam Industries, Ltd. who has a long successful history in the music industry and has been a long-term business partner with US Music." Rudy added, "It has been a thrilling and rewarding 40 year ride that has allowed me to realize my dreams and goals that would not have been possible without the support of our customers and suppliers. It is now time to hand the reins over to a valued and trusted partner." Marty Golden, chairman of Jam Industries Ltd, commenting on the purchase of US Music said, "It is with great pride that we have been able to come to an agreement with Rudy and US Music Corp that will enable US Music and its worldwide brands... to continue to grow and prosper going forward. We envision that US Music will operate as an independent and wholly owned subsidiary of Jam Industries under the guidance of its current president, Barry Ryan." In closing, Marty Golden stated, "We are confident that we will be able to leverage our combined companies strengths and past successes to even greater results. In addition, we will continue to tap into Rudy's creative and intuitive instincts as well as his supplier knowledge as we make the transition to the next chapter in US Music's history." U.S. Music Corp's family of brands includes: Washburn; Randall; Eden; Parker; Soundtech; Oscar Schmidt; Vinci; and GWL. Jam Industries, Ltd. is a Quebec-based company that has been distributing musical instruments and related gear for over 30 years. Okay, so "with a little help from my friends" we have managed to sorta relaunch the Wikipedia entry for Washburn Guitars. Emphasis is presently on 1978-2009, because that's what I know best, so there's PLENTY of room for input everywhere & especially overviews of the stringed instruments produced 1888-1928. I've got summary lists of modern instruments half-completed: electric guitars, basses, & acoustic guitars, with some rough sketches of mandolin & banjo models. I would most deeply hope that someone around here is actually an "insider" with Washburn, & might steer me towardcredible information about the heyday of the Mundelein operation... but at this point I'll accept hearsay & rumour. Thank you for posting this info! Complicated story, but the fragments are fitting together thanks to the knowledge and speculation compiled here. I'm grateful for the input. thank you for sharing the information.. this should be PIN at the top.. History of Washburn.. The Washburn trademark was introduced by the Lyon & Healy company of Chicago, Illinois in 1864. While this trademark has changed hands a number of times, the historical records have not! Washburn suffered a fire in the 1920s that destoyed all records and paperwork that was on file; in the 1950s, another fire destroyed the accumulated files yet again. When the trademark was revived yet again in 1964, the first production of Washburn acoustic guitars was in Japan. Washburn electric guitars debuted in 1979, and featured U.S. designs and Japanese production. Production of Washburn guitars changed to Korea in the mid- to late 1980s; a number of U.S.-produced Chicago Series models were introduced in the late 1980s as well. Serial numbers from 1988 on use the first two digits of the instrument's serial number to indicate the year the instrument was produced (1988 = 88XXX). This process works for most, but not all, of the instruments since then. Washburn Limited Editions feature the year in the model name. For example, D-95 LTD is a Limited Edition introduced in 1995. No corresponding serialization information is available at this time. Washburn information courtesy Dr. Duck's AxWax. For the sake of others, I'll explain a little. There were TWO major fires at L&H, BOTH in the late 1800s, one of which is sometimes called the Great Chicago Fire (1871). Both times, L&H came out of it very well, having had sense to be fully insured. I'm still piecing together some historical scraps that will wind up on Wikipedia. In any case, "Washburn" did not suffer a fire, as it was a brand name owned by L&H. I have not yet seen any evidence of a fire in the 1920s, though Tonk Bros bought Washburn in 1928, & I wouldn't be surprised if there was an "accident" after the Great Crash of '29. If there were any files destroyed in the 1950s, it was probably paper left over from pre-'40s era. If the brand was actually in use between 1945 & 1974, I will be honestly excited to be offered proof. Until then, I say Dr Duck is a fool. It took me a fair bit of digging to uncover the Beckmen Era (1974-1977). For all I know, the name DID appear somewhere 1964-1974; I've found exactly ONE mention of a late-'60s "Washburn" acoustic that the owner described as a trash import, however it was an archived forum post & there's no way to track him FFI, so I have to discount it. But as one source (at the top of this thread) says those cheezy imports were brought in by Rudy himself (before the Beckmens established the trademark), it would certainly fill a gap in the history. Meantime, any sightings of such "Washburns" should be pointed out!! As far as the "where was my Washburn built" stuff (namely "Production of Washburn guitars changed to Korea in the mid- to late 1980s"), I don't know that this will EVER get sorted out. It's the sort of question I wish I'd pestered Customer Service about while Rudy still ran the joint. Washburn production started in Japan, shifted to Korea, then Indonesia, then Red China... well, mostly. Tonight I spotted a BT-3 at a good price. All the stuck-on tags are intact, which makes it somewhat intriguing. In the photos I can clearly see the MADE IN INDONESIA, which surprised me as the model ran 1997-1999, which I previously would've thought too early for Indonesia. And FWIW, the serial number -- a typed paper label pasted onto the heelplate -- is 17082399. Anyone want to take a shot at the "first two digits" myth? Some REALLY good information in this thread, Tony - thanks for the legwork!